Galactic Center Radio Arc: X-ray gas associated with a radio arc located in the constellation Sagittarius. 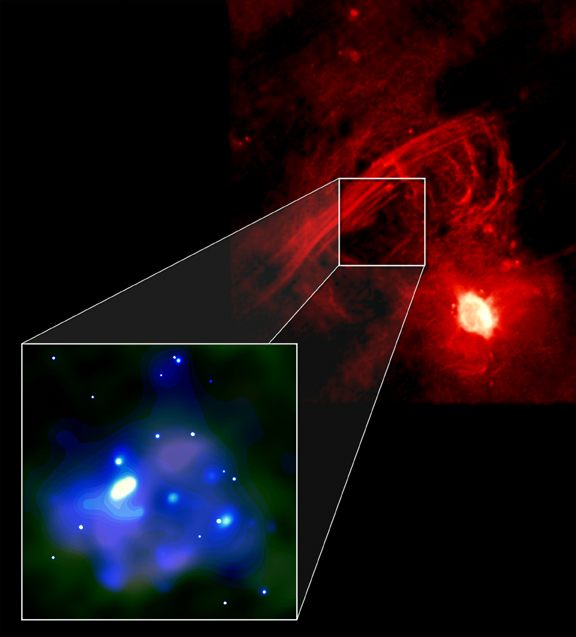 Caption: This Chandra image of an X-ray filament and cloud about 40 light years across (blue inset) was made during an observation of a region of the Galactic Center. These X-ray features are associated with a huge cloud of cold gas (dark area in inset box) that is adjacent to large filamentary and shell-like structures that are bright sources of radio waves (red). The X-rays are thought to be produced when energetic electrons from the radio filaments collide with the cold gas cloud, which has a mass one million times the mass of the Sun. Scale: X-ray/Molecular image is 8 by 7 arcmin; Radio image is 30 arcmin on a side.